For this piece, I was all geared up to write about issues of representation and who was allowed to be seen as Australian in the wake of the Australia Day billboard saga. The huge response to the #putthembackup campaign is still exceeding each amount they set and the initiative is now aiming to raise $200K. Alongside the swell of support against the Islamophobia of the far-right in this instance was a backlash against the entire exercise because the action was read as forcing Muslim Australians to be complicit in the oppression and erasure of Indigenous peoples. New groups sprang up (including Muslims against Australia Day on Facebook). Among others, Sarah Saleh questioned the politics of perpetuating the colonialist enterprise, Eugenia Flynn emphasised the necessity of working in solidarity, and Fatima Measham addressed fragmentation in activist endeavours. I read various commentaries, followed social media conversations, and felt challenged and uneasy in turn. The challenge is good. Complacency is never a constructive thing when you're wanting to participate in political and social change. So, feeling the push to view things differently and listen to alternative perspectives is confronting and valuable. That's not to say I like it, but I recognise how necessary it is. The uneasiness I felt, however, is what I want to talk about here. The uneasiness did not stem from being challenged. It did not come from seeing debates among Indigenous groups and non-Indigenous communities of colour. These debates can be confronting and difficult, but are necessary and ongoing. There were many good conversations had around the billboard issue. My unease came from a different direction. It came from seeing intra-community tension manifest as vehement dismissal and denigration of those who were considered not 'woke' enough to the politics and embedded racism surrounding Invasion Day and invocations of Australian identity. Many took the opportunity to target their own cultural communities with aggressive and condescending commentary. Some lamented that members of their own community didn't know what was good for them; others attacked those who might participate in, or value any aspect of, Australia Day as malicious dupes; and one person even sneered at migrants' 'desperation' to belong to their new communities. "There are many things I'd like to say to those who would attack their own communities in these ways. I will limit myself here to one: Consider your critical privilege before condemning others for not being as 'right on'." In the face of this intra-community conflict and the desire for critical capacity-building, Saleh flagged the necessity of building 'awareness and resilience in our communities' for anti-racist work. Nakkiah Lui posted a plea to her readers not to put down members of their own community for their views, emphasising that political action can take different forms. Measham states that building momentum for social justice work 'can't happen unless people feel safe about being wrong; that helps them to be willing to learn'. There are many things I'd like to say to those who would attack their own communities in the ways I've mentioned. I will limit myself here to one: Consider your critical privilege before condemning others for not being as 'right on' in their politics. No-one springs forth fully formed in their activist beliefs and armed with transformative strategies for action. The process is long, often painful, and almost never straightforward. How did you find your way into the kinds of social justice and anti-racist work that you do? What informed your activist outlook? How has your participation in social justice events and projects been enabled in terms of available time and resources? What forms of education have you had around these issues? If some from your own community have not had access or opportunity to know and act on various issues, I'd suggest it's more helpful to find ways to address this than to assume anyone who's not with you is an establishment drone. There are great resources out there to support discussions and actions around this (this post on building solidarity across difference from openDemocracy, for example). Denying agency to those who don't line up next to you is a poor way to establish a broader and more effective activist community. My initial difficulty with the billboard was that it wasn't truly inclusive as it didn't reflect our diversity of migrant backgrounds and could be viewed as rendering itself intolerant thus I think it was counterproductive to its aim of perhaps communicating we are Australian too. I think you, or anyone else, needs to be very careful before you/they set themselves up as arbiters of racism, Islamophobia or social justice. Long term the most effective in these fields have been the likes of Gandhi, Martin Luther King and Nelson Mandela, who confronted real oppression in a way which ordinary people could understand and would come on board. They did not communicate in academic cant but ordinary, but eloquent language. Gandhi never failed to criticise those on his side who he felt were not living up to the high standards he expected of anyone involved with the Independence Movement in India. To be well meaning can be a double-edged sword. Someone obviously decided for the purposes of this billboard to be inclusive of Muslims, given the notoriety that they have been forced to live through in this and previous years. Well, some good soul probably thought the same thing for an online University of Western Sydney ad which shows a young woman in a hijab. Unfortunately, the banner for the ad is "Low ATAR?" But, of course, UWS is only making a pitch for any student whose ATAR might make it difficult to be admitted to other tertiary institutions, not implying that young hijabis are educationally challenged. Here I will make an admission: I didn't even know about the billboard furore. What I do know I've learned from this article. Looking at the picture, I think it's great to see happy, smiling faces waving the flag of their country. There isn't anyone in this country that doesn't have some issue(s) in their lives and others can put those issues in some sort of order (1 to 10) without really knowing the individuals involved. I can speak only for myself. And perhaps I can listen a little more to others. For heavens sake- a country set alight by a billboard of two little Hazara girls smiling and waving a flags- who the bloody hell are we? Honestly was this not a vocal minority screeching gievance which then excited a few more. 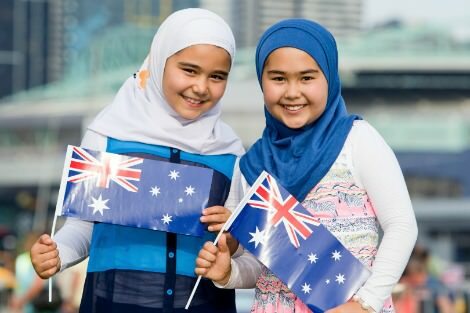 I cant believe that we are such an aggrieved lot that we work ourselves into a lather over two little girls who are not "blue eyed anglo christian" celebrating Australia day. Surely an adult intelligent response would have been to line up a few more illustrations of our diversity (which is real) and tell the shouters to get over it. As a sixth gen Anglo Australian I would like to see that the debate is about changing the day from one which is so insensitive to our Indigenous brothers and sisters. But then perhaps the billboard bashing was useful to shut down this deeper malaise. hmmm. Is not the problem one of young girls, below the age of adult consent, "having to" wear clothes which hides their hair, and all their arms and leg, presumably because in their community of origin this is considered too sexually stimulating. The question that arises is this acceptable in Australia in 2017? Actually, Pamela, you've raised an interesting point about Muslim "inclusiveness" and "solidarity" by raising the point that the girls in the ad looked Hazara. In their own country the Hazara, both an ethnic and religious minority, the latter due to their Shi'ite faith, are traditionally regarded with contempt and hatred by the largest ethnic group the Pushtuns (Pathans) , who were and are the ruling elite in Afghanistan and the backbone of the Afghan and Pakistani Taliban. The Hazara were persecuted under the Taliban. I wonder if my raising this would be regarded as 'politically incorrect', possibly 'Islamophobic' and something to be suppressed although what I've raised is verifiable? The Muslim community in Australia is not monochrome and members of the Sunni majority have a variety of attitudes towards the minorities such as the Shia; the Alawis; the Alevi-Bektashis from Turkey (a discriminated minority in their own country who are not officially recognised nor given legal status there but are in Germany) and most controversially the Ahmadiya who have officially been declared 'non-Muslim' in their country of origin Pakistan. This back and forth responses to the advertisement is getting out of hand/Why not include an indigenous person in such a clip/In our present political climate showing two Muslims in their Hijabs could be deemed to be inflammatory to people who are keen to keep the Anglo Saxon way of life kept alive/This is not wrong because Aussies have always been fair minded but to hoist all cultures in a manner advertised can raise the hackles of people who hurt to see their culture being eroded. I'm with Pamela. We don't have to include an example of every dimension of our diversity in every billboard, or every TV production for that matter. it's appropriate, from time to time, to feature those often excluded, whether on the basis of race, religion, sexual preference,disability, or whatever. As for the headgear, it's hardly different from that which nuns wore when I was a child. Get over it everyone. Every wave of immigration contributes to our culture and leaves its mark. Anglo- celts could benefit from adopting Muslim attitudes to alcohol. "Anglo- celts could benefit from adopting Muslim attitudes to alcohol." No need, Ginger Meggs. Before most Australians knew much about Muslims, they would have known about the teetotalling Salvation Army, especially those pub-dwellers who put coins in the tins of the Salvo officers who criss-crossed pubs seeking donations. Anglo-Celt culture (as a child of Christian culture) has within itself the resources for renovation and repair. Interesting point Roy, but would the Roman Catholic Eucharist be canonically valid without alcohol? Sure Roy, we've had the Salvos and the Rechabites and the WCTU and the Band of Hope and other 'temperance' movements (some religious, some not) but they have never become mainstream in either a religious or a secular sense. And sure, every culture has within itself, hopefully, the ability to evolve and reform itself. But when you look at the level of alcohol abuse in this country today, it is surely reasonable to point to the way another culture/religion has dealt with it. The point that I was trying to make was that every wave of immigration to this country has made a positive contribution to our culture and left its mark. Sure, it has changed the country and the culture, but that's the nature of immigration. What's all this talk about "intra-community conflict" and "new groups springing up"? Oh, it's just Facebook! Try reading some of the vitriol and twisted contortions of over-incubated political correctness in the discussions at The Guardian (especially anything to do with religion - and the Pope) and it will seriously leave you in tears. Pamela there has been protest regards the date from indigenous and their supporters including the song January 26th by an indigenous activist singing group (available at https://www.youtube.com/watch?v=tZ9qeX4gUeo) which rated on triple J's hottest 100. There has also been debate in letters pages of mainstream media though interestingly most date changes suggested reflect a privileged perspective the day Matthew Flinders completed circumnavigating Australia, or January 1 because we were Federated, or August 16 as the day the Mabo decision was handed down, or the anniversary of the 1967 referendum May 27, possible republic day. Indigenous leader Warren Mundine in the Koori Mail of Jan 25 also expresses his thoughts on the matter. Another approach suggested has been to alter the nature of the day in the way it commemorated. For some time the smoking ceremony which is the first action of the day reflects the wisdom of our indigenous leaders as its purpose is to cleanse. Could Treaties be enacted in that day as a first order of business and be announced. could there be processes to grieve the loss and celebration of indigenous culture which has survived despite the odds. Finding ways to acknowledge Windradyne and Pemulwuy, even a statesman like Bennelong as well as those who stepped outside the colonial mindset and found ways to cooperate respectfully as depicted through Bangarra's programs like Patyegarang. Good balance thanks. While we may disagree with another's viewpoint we must defend to the uttermost their right to say it; even more so in public.